This is a fantastic follow-up to Young Elites. I started reading, tried to pace myself, but couldn’t. I’m in love with Adelina as a character; she’s dark and everything a villain should be, yet she’s the protagonist (right?). I love the gray area surrounding her and her new friends – particularly the good-natured trickster, Magiano. 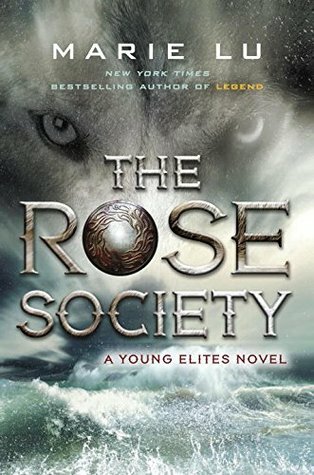 From the ending of the last book, I had a sneaking suspicion of what would happen in the The Rose Society – and I was right. Spoiler in white: Enzo, the love interest, died in the Young Elites, but there’s mention earlier about an Elite who could bring people back from the dead – and that’s the chapter the book ended on. So, book 2 starts with the Daggers plotting to bring Enzo back from the Underworld. And they succeed. And boy – this book kept me reading until the wee hours of the morning. Rarely does a book sink it’s fangs in that deep and refuse to let go. I haven’t even finish this book and I’m looking forward to the final book in the trilogy. I am in love with the dark side of these books, the characters, and the threads that keep twisting, twisting, twisting. The pace is these books have been fantastic. We don’t stop and smell the roses every few pages or have to sit through long, odious narration of backstory and world-building. Everything is delivered neatly, well-packaged, and well-constructed. It moves so fast, I almost wish there was more to read – but at the same time I don’t. Overall, I give The Rose Society a 4 out of 5. That last point was lost for little things, like the recurrent “a memory comes to him” motif, and the the whole thing where a bunch of grown men mercenaries decide to follow a sixteen year old girl into a war with the Inquisition. And, although I love the characters, I can’t see them very clearly. The same traits are repeated over and over, like hair and eye color. I need to learn this type of writing, I think it all starts with readings like this one, which caught my attention…made me want more and more, loved it! Yes! I love this style. Thank you so much, I’m looking to be a good writer, I have one book I’m waiting for Dorrance publishing to publish then looking to self-publish after.Thank you so much I’m checking it out now!